Exterior is covered with rugged nylon. 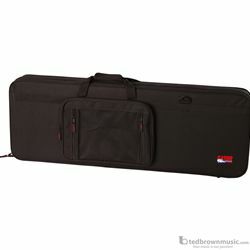 Perfect cross between hard case and gig bag. Internally constructed of dense EPS foam. Nylon web carry handle. Two accessory compartments. Comfortable removable shoulder strap. Interior is covered in soft plush with foam support for the neck.